We got our hands on the new 2019 Harley-Davidson Street Glide Special, and to add flavour to our story, we also roped in the Indian Chieftain Road Master Classic as well. The idea was to see which of these two American cruisers is the true king of the road. For a long time now no touring motorcycle has come to India. I guess the focus has shifted elsewhere, as big ADVs and mid-segment naked bikes seem to be generating storms of hype nowadays. However, touring is still one of the most popular forms of leisure motorcycling. True, you can tour on any motorcycle, but if you can afford an ultra-luxurious touring motorcycle, then there is no better way to travel cross country. Indian Motorcycle no doubt holds the title of being the most niche motorcycle maker in the touring segment. The Chieftain lineup is full of big beautiful motorcycles that will allow you to travel in style and comfort. However, Harley-Davidson holds the title of being the most popular big cruiser motorcycle maker in India, and they have sold thousands of bikes since they entered the Indian market 10 years ago. HD has just added a new model to its 'Touring' line of motorcycles – the Street Glide Special. How does it stack up against the mighty Indian Roadmaster? Well, we found a nice open stretch of highway and set out to discover. When it comes to design, all these motorcycles more or less have the same layout – big wheels, massive front fairings & fenders, wide leather seats, high handlebars and saddle bags (hence the term baggers). But the difference lies in details. The Indian, in this case, has paid a lot more attention to details, and the overall design of the bike is simply incredible. The Roadmaster is basically a heavily customised Chief, and it gets a host of features and accessories. And the detailing is immaculate. The bike relies heavily on its retro style, and the front wheel fender and the saddlebags really stand out. It's a long motorcycle at 2,656mm, and it weighs an incredible 410kg. The entire design of the bike is absolutely stunning, but the centrepiece is, of course, the massive 1,811cc engine decked out in chrome. 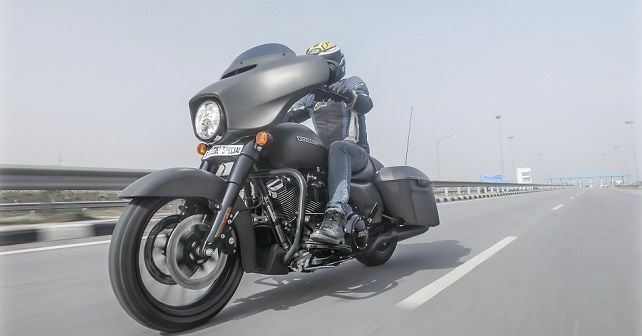 While the Indian is distinctly more retro, the Harley-Davidson Street Glide Special is more modern, thanks to its dark colour scheme and its blacked-out look. And, it’s also the newer of the two. The forks, handlebar, tank console and exhaust, are all black, and I really like its fresh take on the modern luxury cruiser. However, the Street Glide is much smaller than the Indian. At 2,425mm, it is shorter, and at 362kg, it is much lighter. Which one looks better? I like the Street Glide Special, but the Indian definitely gets a lot more stares on the road. Even though the Indian Roadmaster is a little older, it still gets state-of-the-art technology and features. Aside from the usual ABS, cruise control and LED headlights, the Roadmaster gets a wonderful Ride Command System. The touchscreen allows you to toggle through the vehicle information, and it also gets navigation and Bluetooth. You can read your messages on the screen, and you can also play music as you cruise down the open highway. The speakers are wonderful, and the volume is automatically adjusted according to engine noise, wind and speed. The Roadmaster also gets heated grips and an electrically adjustable windscreen. The Street Glide Special also gets standard features, such as ABS and cruise control, but it shockingly misses out on LED headlights. However, HD has updated its infotainment system on the bike. It now gets the new Boom Box GTS infotainment system. The touchscreen is much sleeker in terms of design, and it looks a lot more contemporary. You can toggle through vehicle information, and it also gets navigation and Bluetooth. The speakers are good but, I found the speakers to be a lot more effective on the Indian. Both bikes have the same size engine. The Roadmaster gets the 1,811cc V-Twin developed by Polaris, which is a masterpiece. The engine is incredibly smooth and refined, and it pumps out 151Nm of torque at 3,000rpm. The throttle response is on point, and you will be amazed at how quickly the bike picks up speed. However, if you are looking to travel at high speeds way above the speed limit, you will be disappointed, for the engine is tuned for more relaxing cruising speeds. The Street Glide Special gets the new Milwaukee-Eight 114 engine, which is also the product of brilliant engineering. HD developed these new engines to be refined and powerful, and they do the job extremely well. The 1,868cc V-Twin pumps out even more torque –163Nm at 3,000rpm. The throttle response is more aggressive, and the bike accelerates much quicker. The exhaust note is also much more noticeable. Overall, the Street Glide feels a bit sportier than the Roadmaster. The Indian Roadmaster offers a more laid-back riding experience. It's all about cruising at relaxing speeds and touring the country-side. You can cruise down the open road in the utmost comfort, feeling relaxed and calm at all times. The bike doesn’t feel heavy at all, unless you are in the traffic, and there it can take a lot of time getting used to. Out on the open road is where this bike belongs. The ergonomics are practical, and you really feel like you are riding a sofa on wheels. Even the pillion rider will be able to enjoy the ride in the lap of luxury. The Street Glide can offer you comfortable cruising as well. The bike is also very comfortable, but it also has the added benefit of being lighter, easier to handle and a lot more fun on the throttle. This bike really puts a smile on your face and makes you feel like a proper speed-demon. The suspension of both these machines is tuned for smooth surfaces, so don’t expect much on crappy roads. However, the Street Glide allows you to easily adjust the rear suspension. The overall ride quality is also more or less the same on both bikes, but the newer and more powerful Milwaukee-Eight engine also feels just a tad bit smoother. The clutch is not heavy on either of the machines, and they both get 6-speed gearboxes that work wonderfully and smoothly. For me, the winner here is the HD Street Glide Special. I just like the way it looks and the way it rides. Then again, the Indian really does cater to older riders who want to be on the most comfortable motorcycle possible, which is also easy and relaxing to ride. Let's also not forget that the Roadmaster carries a price tag that starts at Rs 42 lakhs, which is Rs 10 lakhs more than the Street Glide Special. The HD just has a lot more character in the way it rides, and I like that about it. Both bikes come with the best features you could possibly ask for on a touring machine, and both will really make you feel like you are the king of the road. It all comes down to what kind of a rider you are and what piques your interests more. The Indian caters to a different kind of rider than the Harley. But they both serve their purpose of being true touring luxury motorcycles.